This is an important part of the Strategic Pipeline as well as of the ongoing product and investment pipe line. Government initiate, funding and contracts are the driving force of economic growth — this layer of the business model allows the strategic plan to be developed into an Operational Business plan to be presented to financial institutions for funding. At this layer, timing is important; this covers government plans and access to government objectives both long and short term. It is also important to be recognised within government cycles. This layer allows the introduction of governmental projects into the financial system at an early stage. The financial system will create funding opportunities through a mixed blend (Blended Finance). This combines different types of finance of different funding methods and developing layers of funding types – from Government Funding, International Subsidy, Bank and Private Equity, Private banking, and in some cases section funding, according to the type of the project and the financial requirements of a given project. This layer allows the operational plan to implemented – with a operational base of contractors – that can provide operational support and delivery to the business plan and the operational project as well as Joint Venture Partnership and development. This is a flexible layer that can create, develop and risk-take in projects. This layer allows commercial risk to be defined better and apportioned to various parties that make up the Financial Layer. It also introduces stronger partnership, collaboration and Joint Venture agreement to be implemented. This is a layer that allows extra function to be added to the model. Funding and other project resources can be packaged and distributed at this layer, such as crowd funding. This is a layer that also allows product development and distribution. 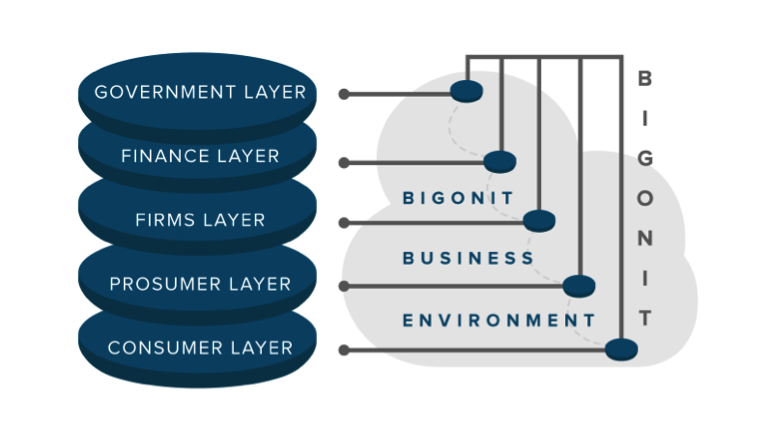 Also refers to the user layer, customer layer, or the layer that consumes the products and services. This layer drives the market and it allows product and service development.